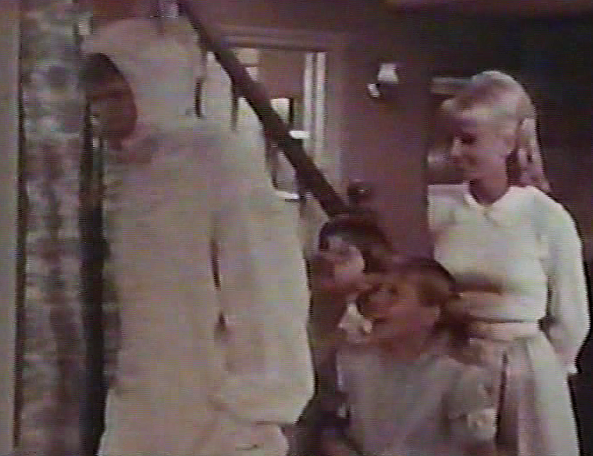 We filmed 14 episodes of “Blondie” but only 13 aired before the series was cancelled. In the unaired episode, Dagwood, wearing a bunny costume, is on his way to perform at an Easter charity benefit when his car breaks down, leading to chaotic encounters with startled drivers, the police, and 12 real rabbits. I’m against vivisection, experimentation on animals. Did you know that product testing labs are STILL vivisecting thousands upon thousands of innocent animals? Because they are mild-tempered and easy to handle, confine, and breed, rabbits are frequent victims of animal experimenters; more than 170,000 of them are abused in U.S. laboratories every year. Despite the availability of more modern, humane, and effective alternatives, rabbits are still tormented in the notorious Draize eye irritancy test, in which cosmetics, dishwashing liquid, drain cleaner, and other substances are dripped into the animals’ eyes, often causing redness, swelling, discharge, ulceration, hemorrhaging, cloudiness, or blindness. After the experiments are over the rabbits are killed. 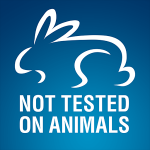 In addition, even though internationally-accepted non-animal methods exist, rabbits’ backs are shaved and corrosive chemicals are applied to their raw skin in skin corrosion tests and left there for up to two weeks. These chemicals often burn the skin, leading to tissue damage. The victims of these tests are given no pain relief during this excruciatingly painful experience and, again, after the test is finished, they are killed. Horrific experiments like those above are being done to cats, dogs, primates, and other animals by laboratories around the world. 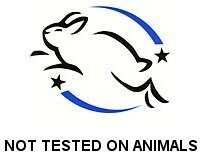 Please say NO to vivisection and boycott any products that have been tested on animals. 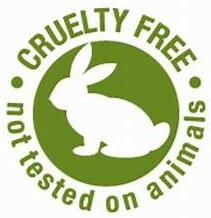 Look for products packaged with the symbol that says, “NOT TESTED ON ANIMALS;” see the samples shown. Go Vegan in the New Year! I want to share with you an absolutely wonderful and poignant plea to go vegan this New Year from FreeFromHarm.org, a non-profit charitable organization promoting farmed animal rescue, education and advocacy. Theirs is one of the best websites out there, and should be a go-to site for you and your friends to learn all about veganism. Try these mouthwatering vegan recipes and feel proud that you are saving the animals, the planet, and yourselves with every bite! I wish you all a very Happy New Year; now let’s come together to make 2018 a Happy New Year for the animals of the earth as well. And as I always say, Peace for ALL the animals with whom we share this planet! Except where otherwise noted, the following text and illustrations are copyrighted by Free from Harm. Please visit them online and on Facebook. We’re taught to think of animals raised for food — if we think of them at all — as an abstract category: “farm animals”— the nameless, faceless herds and flocks whose generic characteristics are merely recycled through an endless stream of indistinct entities. But farmed animals are individuals with unique personalities and emotions, just like cats and dogs. They feel joy, affection, and pleasure, as well as fear, grief, and pain. Like us, they form deep friendships and emotional bonds and like us they seek to preserve their only lives, which they cherish. 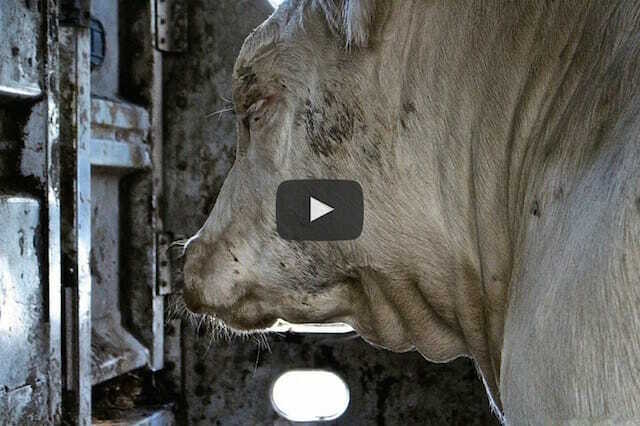 The above footage is not graphic; it shows the experience of a cow who is waiting in line to die. 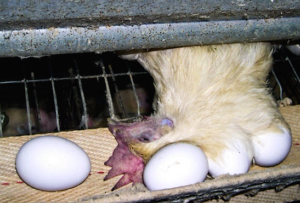 It is a common misconception that animals are not harmed in the production of eggs and dairy. In fact, the egg and dairy industries cause enormous suffering and kill billions of hens and baby chicks and, and millions of cows and calves every year. Hens used for eggs are slaughtered at 18 to 24 months of age when their production declines. In nature, wild hens lay only 12 to 20 eggs per year. But domesticated chickens have been genetically manipulated to produce between 250 and 300 eggs annually, leading to painful and often fatal reproductive disorders. More than 95% of chickens used for eggs are confined in cages so small they cannot even spread their wings, and the majority of “cage-free” and “free range” eggs come from miserable hens packed inside filthy warehouses by the thousands. Most hens used for eggs have a portion of their beaks painfully cut off to prevent nervous pecking in overcrowded conditions, and at the hatcheries where new hens are hatched to be sent to egg farms — including humane label farms, small farms, and backyard hen operations — 6 billion male chicks are destroyed every year by being suffocated or ground up alive. The female calves on this small dairy farm have been taken from their mothers and are being raised in typical calf hutches. Similarly, all dairy farming depends on the exploitation of female reproduction, and on the destruction of motherhood. Like all mammals, cows only make milk to feed their babies. On dairy farms, including small and humane label farms, calves are permanently removed from their motherswithin hours of birth so that humans can take the milk intended for them. Male calves are slaughtered for veal or raised for cheap beef. 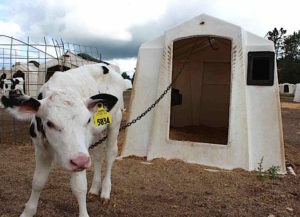 Female calves spend their first 2 to 3 months of life isolated in lonely hutches, with no maternal nurturing during the time they seek it most. Hens used for eggs and cows used for milk are also slaughtered when their production declines, at only a fraction of their natural lifespans. Learn more about the hidden harms of eggs and dairy, even on so-called humane farms, at our features, Eggs: What Are you Really Eating? and 10 Dairy Facts the Industry Doesn’t Want You to Know. A well balanced vegan diet can easily provide all the nutrients we need to thrive. Government health experts worldwide are finally catching up with the large body of scientific evidence demonstrating that a vegan diet is not only a viable option for people of any age, but that eating plant foods instead of animal-based foods can confer significant health benefits, including reduction in incidence of obesity, diabetes, high blood pressure, high cholesterol, heart attack, stroke, and some types of cancer. Learn more at our features, Catching Up With Science: Burying the “Humans Need Meat” Argument and Vegan Diets: Sorting Through the Nutritional Myths. 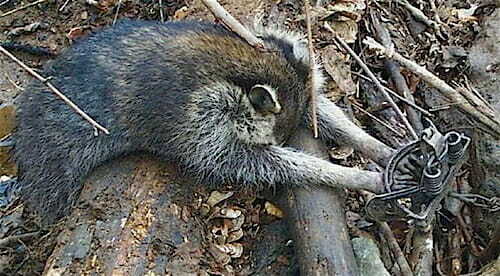 A raccoon left to die in a foot-hold trap. While many people are aware that more than 10 billion land animals are killed for food every year in the U.S., far fewer know that in the last decade alone, more than 30 million wildlife animals — many endangered — have been brutally killed by a secretive branch of the USDA that is primarily employed to destroy wildlife deemed a threat to animal agriculture. 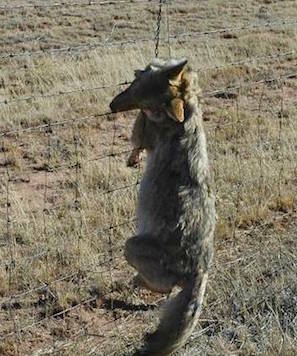 A coyote hangs dead in a government neck snare. Photo by former Wildlife Services employee. In reality, Wildlife Services spends millions of tax-payer dollars each year to kill native carnivores and predators — coyotes, wolves, bears, mountain lions, and many others — on behalf of the livestock industry. These animals are destroyed by the most violent and gruesome methods imaginable: gunned down from helicopters; poisoned; gassed; torn apart by trained dogs; strangled to death in neck snares; and caught in torturous leg-hold traps in which they languish and slowly die. Of the millions of animals destroyed by Wildlife Services each year, coyotes are perhaps the most viciously targeted. Every year, tens of thousands of coyotes die slow, agonizing deaths in traps simply because Wildlife Services is not required to check their traps, and personnel frequently do not return to traps for weeks. Workers also “unintentionally” kill tens of thousands of “non-target” animals each year via indiscriminate and excessive trapping and poisoning. Collateral victims include federally protected golden and bald eagles (who frequently die in leg and neck snares), beavers, armadillos, badgers, great-horned owls, hog-nosed skunks, javelina, pronghorn antelope, porcupines, great blue herons, ruddy ducks, snapping turtles, turkey vultures, long-tailed weasels, marmots, mourning doves, red-tailed hawks, black bears, sandhill cranes and ringtails; as well as swift foxes, kit foxes and river otters, all the focus of conservation and restoration efforts. Thousands of domestic dogs and cats are also killed each year when they stumble upon traps or poisoned baits. The millions of animals being targeted and destroyed by Wildlife Services eat other animals to survive. Humans have no biological need to consume animal products and most of us have access to plant-based foods. Killing animals for food when we have other options, and killing innocent wild animals who have no other options, are equally indefensible practices. 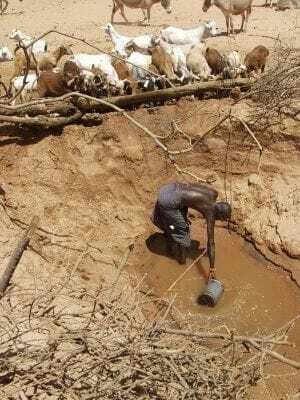 Water-intensive animal farming strains communities already suffering from water scarcity. Photo: creative commons. Of the planet’s nearly 7 billion humans, roughly 1 billion people are malnourished and 6 million children starve to death every year. Farming animals is notoriously inefficient and wasteful when compared to growing plants to feed humans directly, with the end result that “livestock” animals take drastically more food from the global food supply than they provide. This is because in order to eat farmed animals, we have to grow the crops necessary to feed them, which amounts to vastly more crops than it would take to feed humans directly. (We feed and slaughter 60 billion farmed animals every year; there are 7.3 billion humans on earth). To give one example, it takes thirteen pounds of grain to yield just one pound of beef (USDA) — while crops such as soy and lentils produce, pound for pound, as much protein as beef, and sometimes more. Compounding this inefficiency is the fact that only a small percentage of the plant energy consumed by an animal is converted into edible protein. Most of the energy from crops fed to farmed animals is used to fuel their own metabolism, with only a fraction of those grains and other plants being turned into meat. In fact, analysis of global agricultural yields finds that better use of existing croplands could feed four billion more people simply by shifting away from growing crops for animal feed and fuel, and instead growing crops for direct human consumption. Reallocating croplands in this way could increase available global food calories by as much as 70 percent, according to researchers. To learn more about the ways animal farming contributes to global food insecurity and hunger, visit A Well-Fed World. Animal agriculture is the single greatest human-caused source of greenhouse gases, land use, and land degradation; the number one source of freshwater pollution, and the leading driver of rainforest destruction. It is also a major cause of air pollution, habitat loss, and species extinction, and is a highly inefficient use of limited natural resources. The United Nations has called for a global shift to a vegan diet wherever possible as the most effective way to combat climate change, world hunger, and ecological devastation. 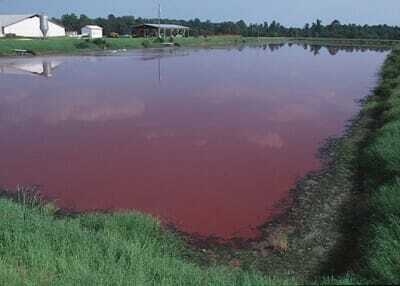 The area around a single hog slaughterhouse can contain hundreds of waste lagoons. The interactions between the bacteria, blood, afterbirths, stillborn piglets, urine, excrement, chemicals and drugs frequently turn the lagoons pink. Even with intensive confinement “factory farming” methods currently dominating global animal agriculture, farmed animals still use 30 per cent of the earth’s entire land surface. If we attempted to pasture all 100 million cows in the United States on grass, as humane/sustainable farming advocates suggest, cattle would require (using the conservative estimate of 10 acres per cow) almost half the country’s land — which doesn’t include all the land we would need to raise all of the pigs, chickens, sheep and goats free range. The leading cause of death of both men and women in the United States is heart disease. Every day, nearly 2,600 Americans die of some type of heart disease, the most common form being coronary heart disease, also known as coronary artery disease or atherosclerosis. Atherosclerosis occurs when hard layers of plaque, usually cholesterol deposits, accumulate in major arteries and begin constricting flow of blood and oxygen to the heart. Arterial plaque is also a leading cause of stroke, the fourth greatest killer of Americans each year. While other factors can affect cholesterol levels and heart disease (including smoking, exercise, blood pressure, and body weight) one of the single most significant causes of heart disease is dietary cholesterol. 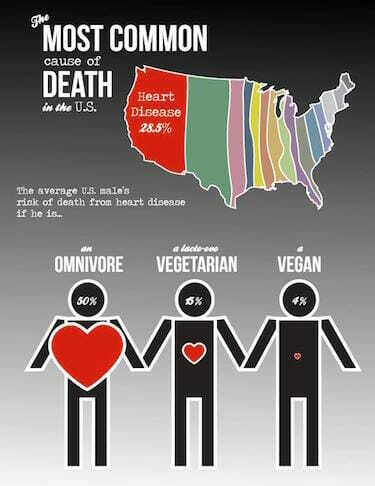 Our bodies make all the cholesterol we need, so consuming animal products contributes excessive levels. (There is no cholesterol in plant foods). Animal products are also loaded with saturated fats, which, unlike unsaturated fats, cause the liver to produce more cholesterol. Fortunately, for most people, preventing coronary heart disease is as simple as eliminating animal products, eating a healthy plant-based diet, exercising, and avoiding cigarette smoking. But beyond prevention, a plant-based diet is the only treatment that has been scientifically proven to reverse heart disease. Vegan diets have also repeatedly shown to reduce levels of LDL, or “bad” cholesterol. According to a study published in the American Journal of Cardiology, a low-fat vegetarian diet reduces LDL by 16 percent, but a high-nutrient vegan diet reduces LDL cholesterol by 33 percent. The high fiber content of plant-based foods also helps to slow the absorption of cholesterol. Animal products contain no fiber. 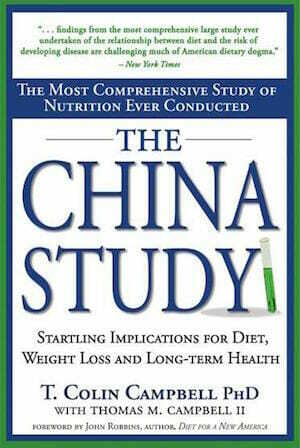 The China Study examines the relationship between meat, egg and dairy consumption and chronic illnesses including heart disease, diabetes, breast cancer, prostate cancer, and colon cancer. Based on a meta-analysis of diet and disease rates in thousands of people in rural populations of Taiwan and China, Dr. Campbell concludes that people who eat a whole foods, plant-based diet—excluding all animal products—can avoid, reduce, and in many cases reverse the development of numerous illnesses, including most of the leading fatal Western diseases. “Consider again the anatomy of the carnivore and the omnivore, including an enormous mouth opening, a jaw joint that operates as a hinge, dagger-like teeth, and sharp claws. Each of these traits enables the lion or bear to use her body to kill prey. Herbivorous animals, by contrast, have fleshy lips, a small mouth opening, a thick and muscular tongue, and a far less stable, mobile jaw joint that facilitates chewing, crushing, and grinding. Herbivores also generally lack sharp claws. 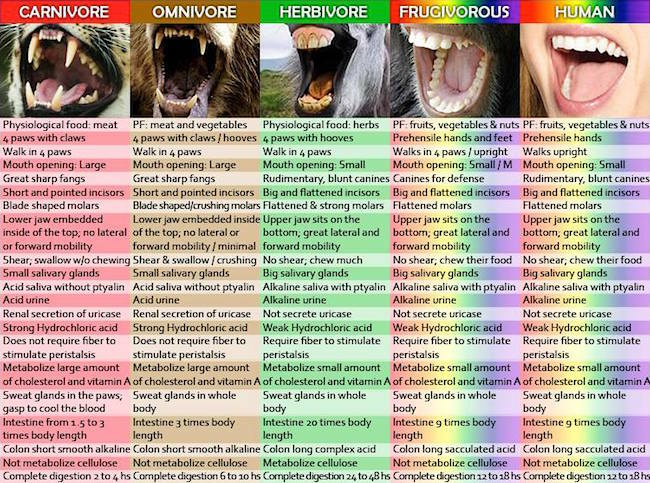 (14) These qualities are well-adapted to the eating of plants, which provide nutrients when their cell walls are broken, a process that requires crushing food with side-to-side motion rather than simply swallowing it in large chunks the way that a carnivore or omnivore swallows flesh. Herbivores have digestive systems in which the stomach is not nearly as spacious as the carnivore’s or omnivore’s, a feature that is suitable for the more regular eating of smaller portions permitted with a diet of plants (which stay in place and are therefore much easier to chase down), rather than the sporadic gorging of a predator on his prey. (15) The herbivore’s stomach also has a higher pH (which means that it is less acidic) than the carnivore’s or omnivore’s, perhaps in part because plants ordinarily do not carry the dangerous bacteria associated with rotting flesh. Harold Brown, former beef and dairy farmer. Harold Brown is a former beef and dairy farmer. He was born on a cattle farm in Michigan and spent over half his life in agriculture. After a personal health crisis forced him to confront the incidence of heart disease in his family, he went vegan. Living in great health on a vegan diet led him to reexamine all of his previous assumptions about eating animals, and he soon experienced a profound conviction that needlessly exploiting and killing animals for food is immoral. 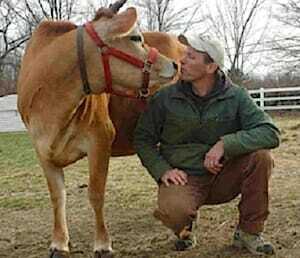 Now a vegan activist, he is the founder of Farm Kind and one of the subjects of the documentary Peaceable Kingdom: The Journey Home. “I have often heard the word “humane” used in relation to meat, dairy, eggs, and other products… I have always found this curious, because my understanding is that humane means to act with kindness, tenderness, and mercy. I can tell you as a former animal farmer that while it may be true that you can treat a farm animal kindly and show tenderness toward them, mercy is a different matter. …I hardly thought twice about the things I had to do on the farm: driving cattle, castrations, dehorning, and I did my fair share of butchering too. Read more powerful testimonies from former meat and dairy farmers who went vegan, here. 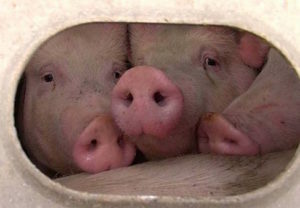 Pigs in their final moments of life, in a transport truck about to unload at a slaughterhouse. Photo: Toronto Pig Save. The very existence of labels like “free range,” “cage-free,” and “humane certified” attests to society’s growing concern for the welfare of animals raised for food. But any time consumers of meat, eggs or dairy advocate for “humane” treatment of farm animals, they confront an unavoidable paradox: the movement to treat farm animals better is based on the idea that it is wrong to subject them to unnecessary harm; yet, killing animals we have no need to eat constitutes the ultimate act of unnecessary harm. Unlike animals who kill other animals for food, we have a choice. 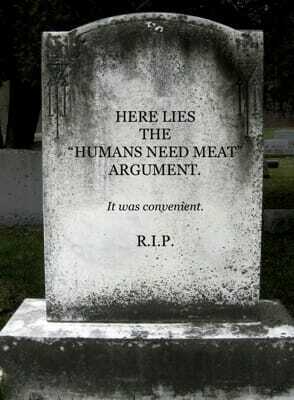 They kill from necessity, whereas most humans do so for palate pleasure, custom or convenience. But there is a vast moral difference between killing from necessity and killing for pleasure. When we have a choice between sparing life or taking it, there is nothing remotely humane about inflicting violence and death on others just because we like the taste or the tradition, and because they cannot fight back. Might does not equal right. Too, many of the worst cruelties inflicted on animals in factory farms are also routine practice on small, free-range farms, even on the best “humane certified” farms. These include: sexual violation and reproductive exploitation; the systematic destruction of motherhood; excruciating mutilations without anesthetic; and denial of instincts and preferences essential to animals’ basic well-being. It has been estimated that 98% of our harm to animals comes from our food choices. Yet science has irrefutably demonstrated that humans do not need meat, dairy or eggs to thrive. Once we understand that eating animals is not a requirement for good health, and if we have access to nutritious plant-based foods, then the choice to continue consuming animal products anyway is a choice for animals to be harmed and killed for our pleasure — simply because we like the taste. But harming animals for pleasure goes against core values we hold in common — which is why, for example, we oppose practices like dog fighting on principle. But it can’t be wrong to harm animals for pleasure in one instance, and not the other. The only way for our values to mean anything — the only way for our values to actually be our values — is if they are reflected in the choices we freely make. And every day, we have the opportunity to live our values through our food choices. If we value kindness over violence, if we value being compassionate over causing unnecessary harm, and if we have access to plant-based alternatives, then veganism is the only consistent expression of our values. A note from Free From Harm: It’s important to recognize that veganism isn’t just a diet. Our society is literally built on animal exploitation, from clothing and cosmetics to household cleaners, from cruel medical experiments to puppy mills. Living vegan thus entails an effort to avoid using animals in all areas of life, but the choices we make about the food we eat are an important and impactful place to start. To learn more about vegan eating, check out our Guide to Going Dairy Free and our Guide to Veganizing Your Favorite Egg Dishes (with tips on cooking and baking without eggs). Also be sure to read this essential overview of vegan nutrition. Questions about B12? Go here. To learn more about the many ways that animals are exploited and what you can do to make a difference, please watch the films The Ghosts In Our Machine and Earthlings. You may not recognize her face, not at first. After all, actress Pamelyn Ferdin is a beautiful grown-up woman now. But if you look closely, you’ll see the sweet and often awkward little girl who starred on a slew of classic TV shows in the 1960s and ‘70s including “Star Trek,” “The Odd Couple,” “Family Affair,” “The Paul Lynde Show,” “CHIPs” and dozens more. Since those childhood days, Miss Ferdin has become a passionate advocate for animal rights. She is so driven for the cause that she has been arrested while demonstrating outside the home of an employee of the Los Angeles Department of Animal Services, serving 36 hours of a 90-day sentence. At The Hollywood Show in Los Angeles, amid signing autographs, Miss Ferdin discussed the lasting appeal of “The Peants” and her passion to help those that have no voice to help themselves. Question: Do you do a lot of these autograph shows where you get to meet the fans? Answer: I haven’t done them in a while. I’m starting to do them again. Q: What the reaction from the fans? A: They are so excited. It just amazes me that these fans are so enamored of my career. It makes me feel wonderful. Some of them have come all the way from England. Q: What is the strangest thing you have ever been asked to sign? A: Oh my gosh! What’s the strangest thing? Probably … I have signed a lot of PEZ dispensers. I guess that’s not strange. Q: How old were you when you did the voice of Lucy in “The Peanuts” cartoons? A: I was around 10. Q: You grew up in show business. Was it something you begged you parents to let you do? A: No, not at all. My mom put me in the business. I had a very Hollywood mother. She put me in, and I just started getting role after role after role. 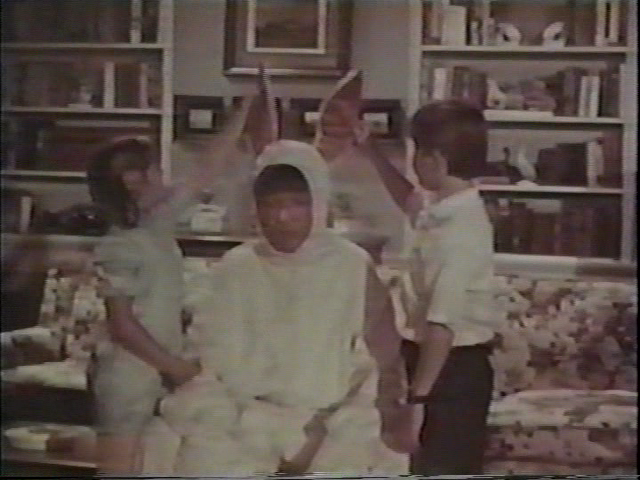 I was probably one of the busiest child actors in, I think, the history of show business up to now. Q: Do you feel like you missed out on childhood since you were busy working? A: Oh yeah. I missed out on a lot because I was working constantly. My life was completely different from a normal child’s life. I got to do a lot of other things, but I missed out for sure. Q: If there was one thing that you missed that you could go back and do, what would it be? A: I really wanted to go to a regular school. I wanted to go to an all-girls junior high. I wasn’t able to do that because they were so strict and I was working so much. And also I would have liked to go to a regular high school and experience what it was like to be a normal kid in high school — without always going in and then being taken out, going back and forth. Q: When you look back on your career, what are some of your favorite moments? Q: You worked with so many legendary actors and actresses. Who were your favorites? A: Tony Randall was a favorite of mine. Well, Bill Melendez, who was the director of “Peanuts,” was absolutely wonderful to work with. “Lassie.” I loved “Lassie.” Lassie was a wonderful being to work with. All these memories. Q: Did you try to continue acting once you became an adult? A: No, because I basically wanted to be a normal person. That’s why I got out of the business and went to college. I became a nurse. I practiced nursing for several years. I got into animal rights. I’m glad I worked as an actress when I did because it was the end of an era, the end of that big Hollywood era. It was great to be in Hollywood when it was more studio-oriented — the very end of that era when everybody knew everybody and they all went to the studio cafeteria. All the stars ate together. It was really a totally different business than it is now. Q: I know you are a passionate animal activist. What are you working on these days? A: Mainly I try to focus on educating the public. I promote veganism. I have been a vegan for about 20 years now. I also promote adopting and not buying your pets. And spay and neuter. It’s important that people realize the suffering that animals endure, whether in the meat industry, the fur industry or being killed in shelters because people don’t adopt them. When people are made aware, they help. Q:What did you think of the recent big scene reboot of “Peanuts”? A: It was great. Anything “Peanuts” I love. I think the cartoons just capture one’s heart. The kid characters were so real, and each one of them had such a unique personality that I think kids and adults could identify with at least one of the characters. And they still can today. For more check out PamelynFerdin.com.